So many residential fencing options: wood fence, vinyl fence, chain link fence…what makes the most sense for your Northern Virginia home? As Virginia’s largest fencing company, Hercules Fence knows a thing or two about fences. And we are more than happy to help you choose a fence that not only meets your style and functionality needs, but also your budget. We know a new fence can be a daunting financial commitment, but as Virginia’s largest fencing company, Hercules Fence is able to buy our fencing products at a price that will afford you value to complement our quality. That’s what we like to call a win-win. Please take a moment to browse our many residential fence offerings, from custom wood to ornamental steel to chain link and so much more! So which type of fence makes the most sense for your Northern Virginia home? If you are worried about price and are more concerned with functionality over aesthetic appeal, a new chain link fence might be the perfect solution. The fences are very affordable, perfect for the cost-conscious homeowner who doesn’t want to spend an arm and a leg for a quality fence. But that is just the beginning. A new chain link fence also provides exceptional security, keeping your child or dog safe and out of harm’s way while keeping intruders and unwanted animals at bay. And then there is the fact that these fences are incredibly low maintenance. A chain link fence is cheap to install and even cheaper to maintain. These fences are durable and made to last! To find out more about the many benefits of chain link fences, give Hercules Fence a call. 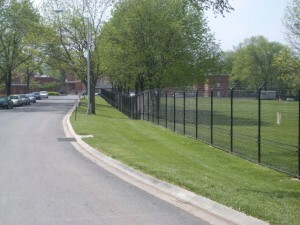 We have been providing chain link fence installation throughout Northern Virginia since 1955. So we know a thing or two about chain link and its benefits. If you have any questions about Chain Link Fence Installation, please contact Hercules Fence of Northern Virginia today by calling (703) 551-2609 or visiting our website. Also, check out Hercules Fence of Manassas on Facebook, Twitter, Google+ and YouTube! This entry was posted on Thursday, April 10th, 2014 at 1:01 pm. Both comments and pings are currently closed.